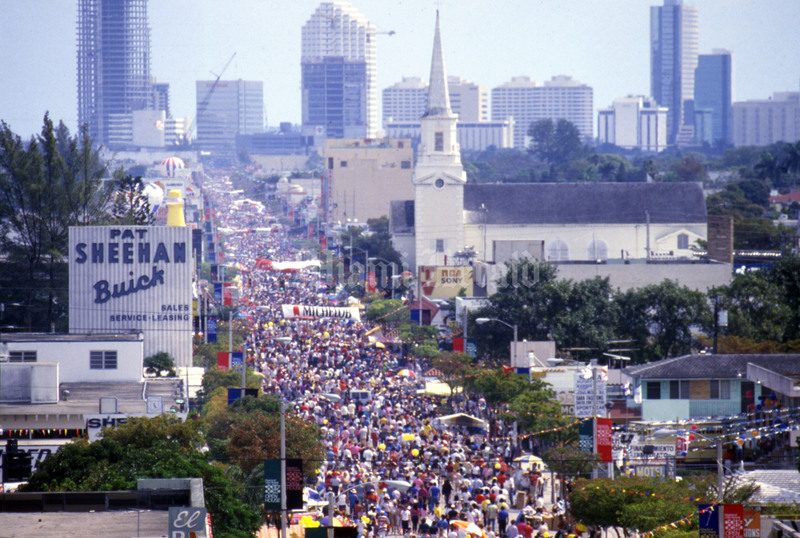 Thousands of people cram Miami’s Calle Ocho, or Eighth Street, for the annual Carnaval street party that includes conga lines, salsa, live music and food. 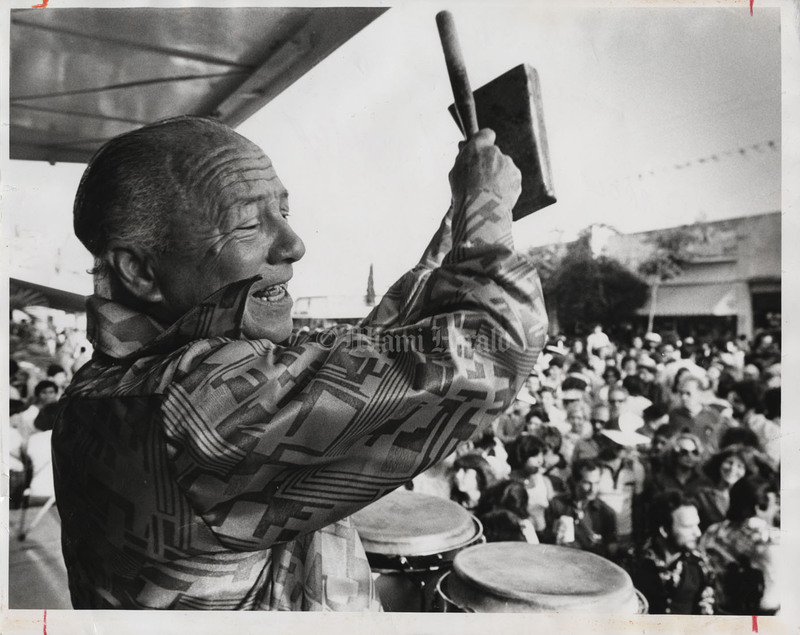 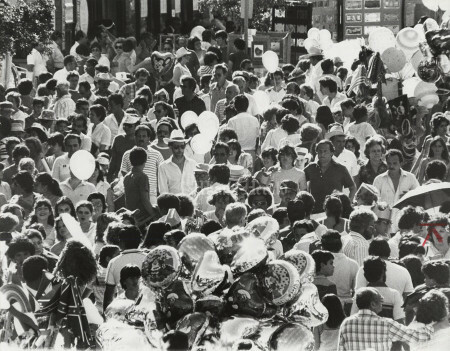 The spring festival held in the heart of Little Havana began in 1978 as a simple block party and turned into a cultural touchstone for the Cuban community. 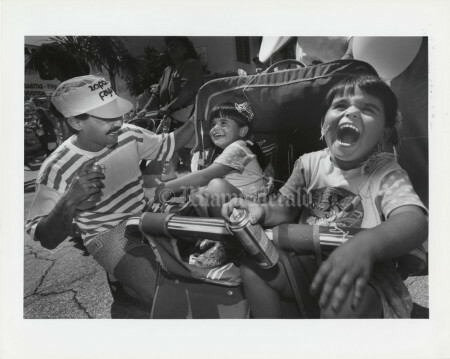 3/15/1992, Candance Barbot/Miami Herald Staff --Dahlia Abreu (right) cracks-up as she and her twin sister Diana get sprayed by their father Carlos Abreu (far left) with a can of plastic stringy stuff. 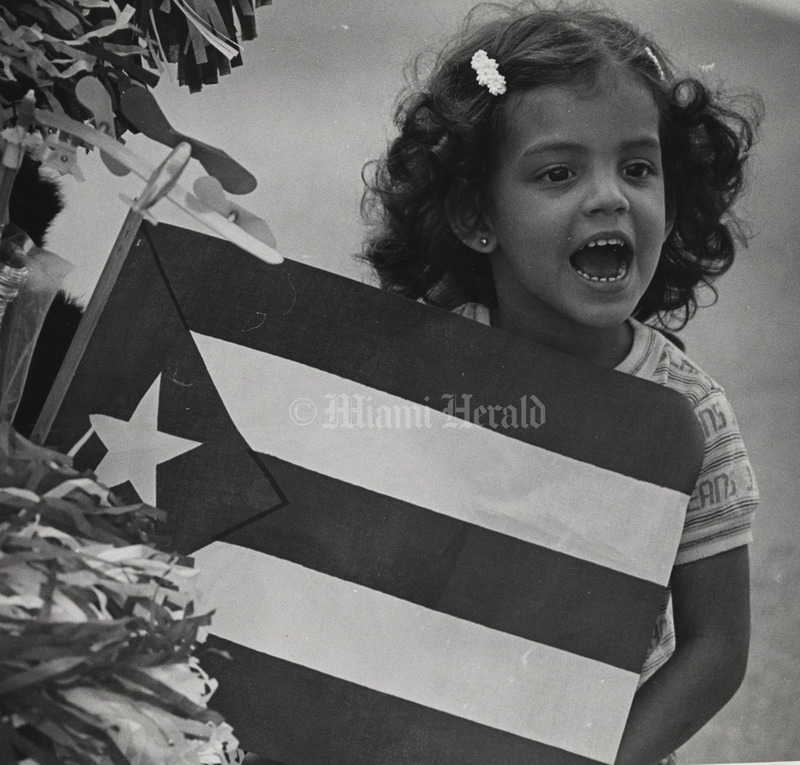 Diana and Dahlia were along with the entire Abreu family to enjoy "Calle Ocho" Sunday in the heart of Little Havana. 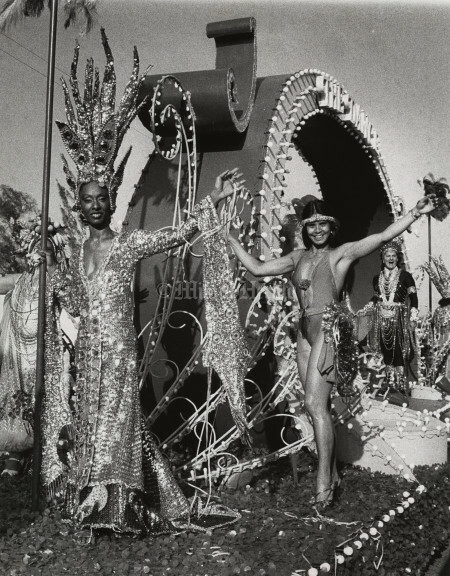 3/14/1993, Hector Gabino/Miami Herald Staff --Magali Ailar y Oscar López enjoyed an afternoon of dance at calle ocho. 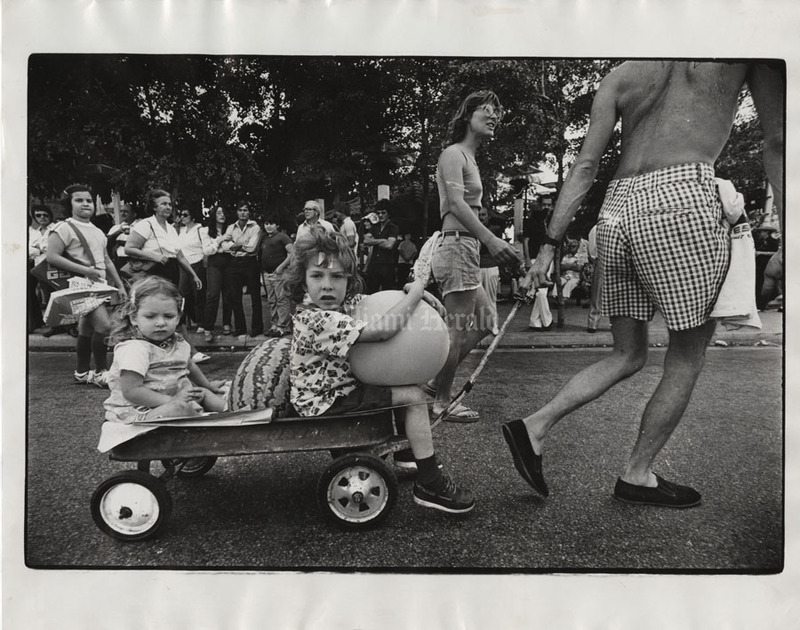 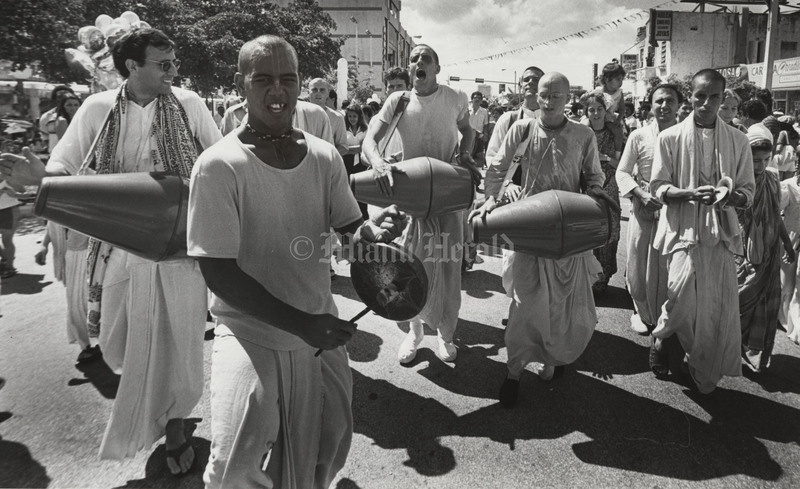 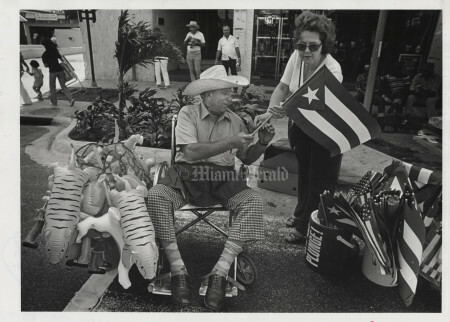 3/8/1992, Candance Barbot/Miami Herald Staff --A personal entry in this year's "Paseo" parade, Guido Rodríguez (center) travels down Little Havana's S.W. 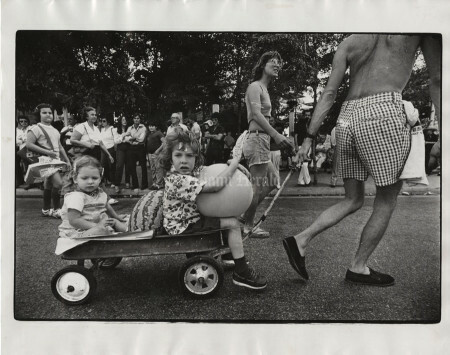 1st Street with Inés Laraundo (left) and Tania Lima (right) in a car entitled: "Burbujas de Amor" (The Love Bubble). 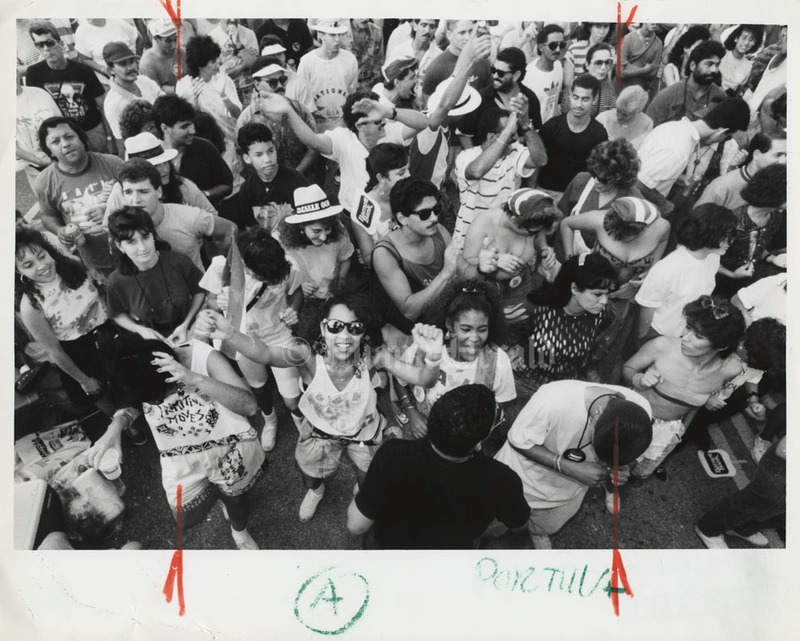 3/12/1990, C.M. 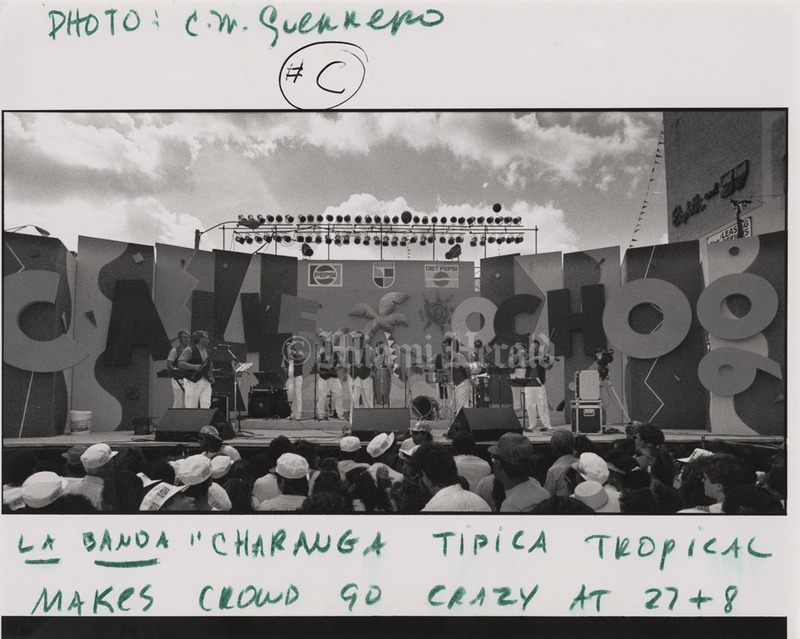 Guerrero/Miami Herald Staff-- La Banda Charanga Típica Tropical makes the crowd go crazy at 27 Ave. and 8 St.
3/15/1982, Albert Coya/Miami Herald Staff-- Crowded Calle Ocho. 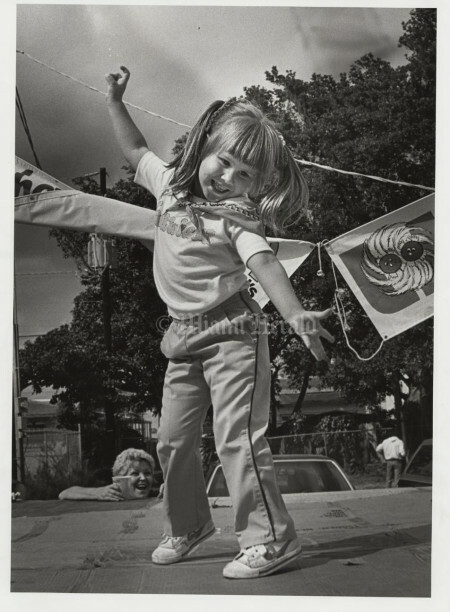 3/12/1979, Marlin Levison/Miami Herald Staff-- Alana Burman 2, Ben Burman 6, Ruth Beller and pulling wagon, father Randy Burman. 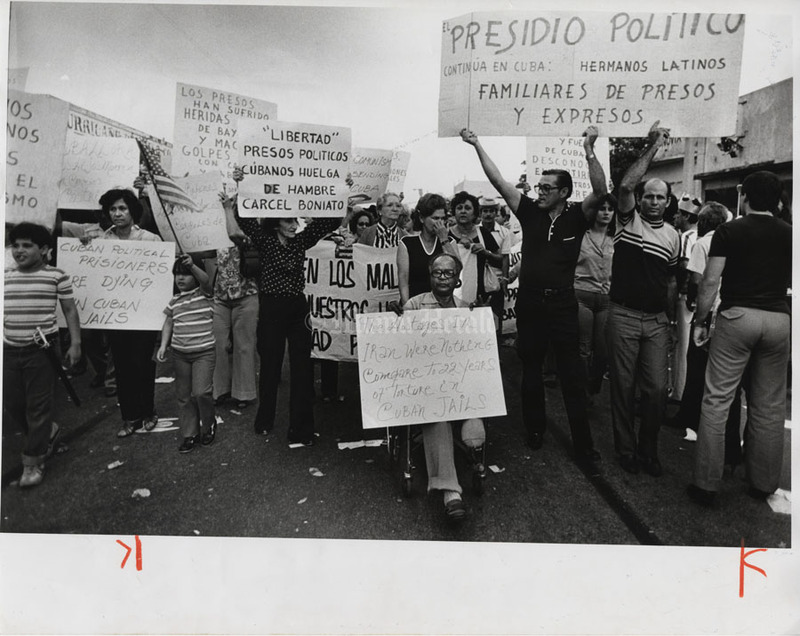 Undated, Miami Herald Staff --A group of protesters with banners walking down eight street during carnaval. 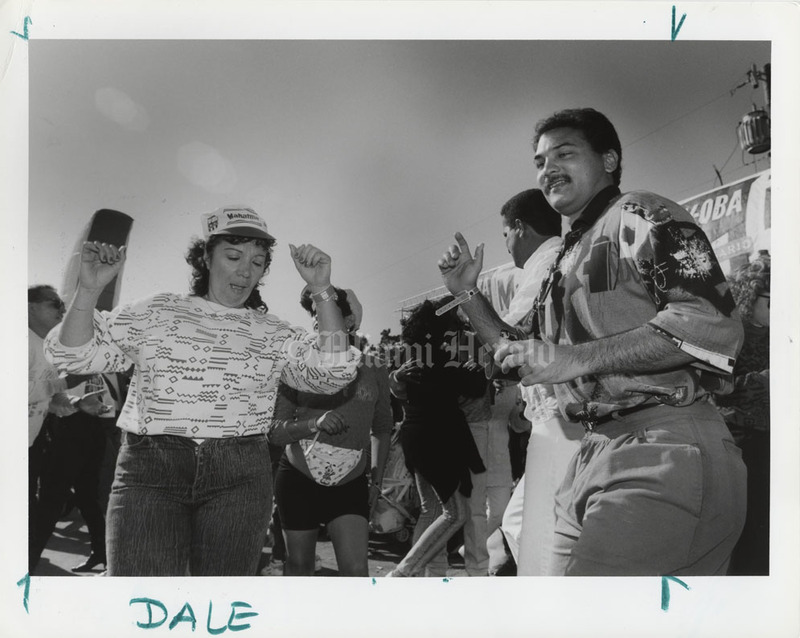 3/5/1984, Albert Coya/Miami Herald Staff --Tiffany Rodda shows her dancing capabilities. 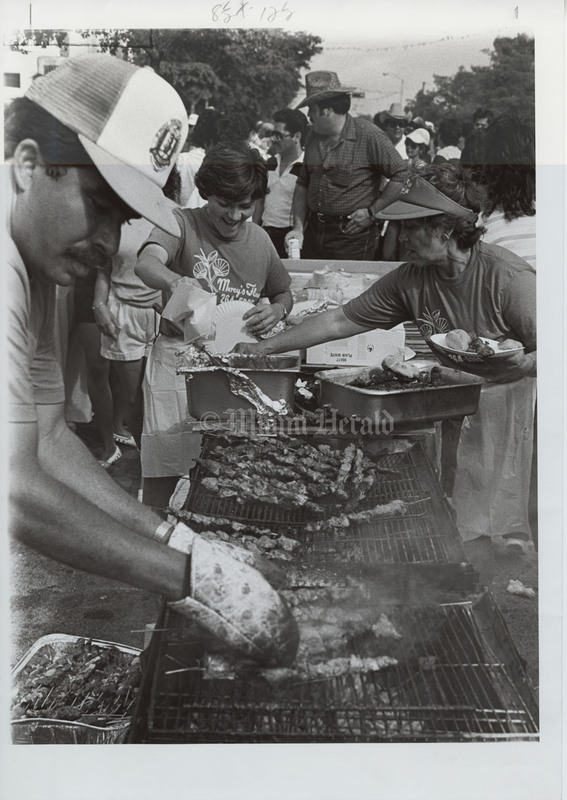 3/5/1984, Albert Coya/Miami Herald Staff-- Carne en el pincho (meat on the grill) at Calle Ocho. 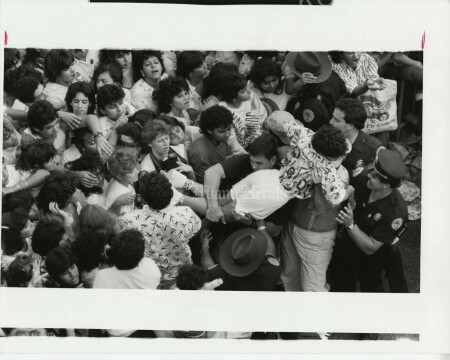 3/9/1986, Bill Frakes/Miami Herald Staff --Woman who fainted is carried over crowd at Menudo concert. 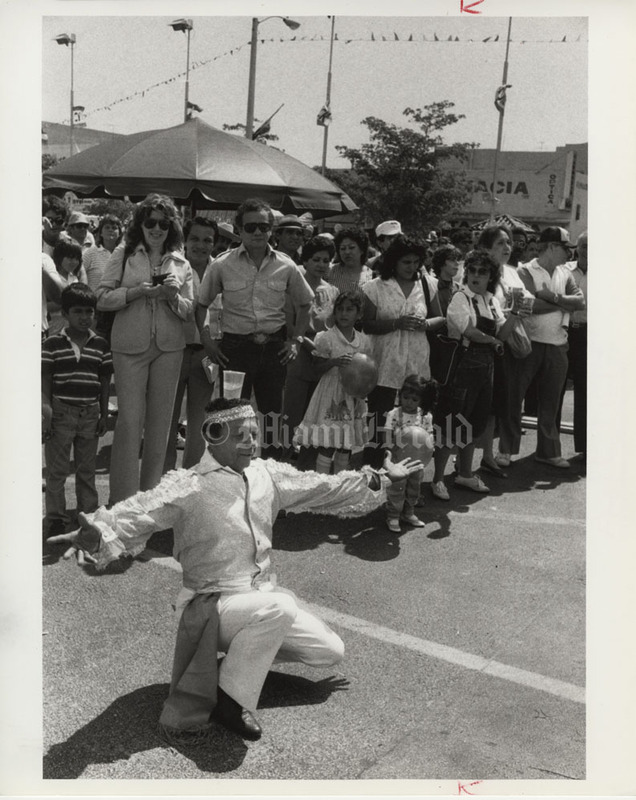 3/9/1981, Carol Guzy/Miami Herald Staff --Damilo and his "bongoseros" on Calle Ocho. 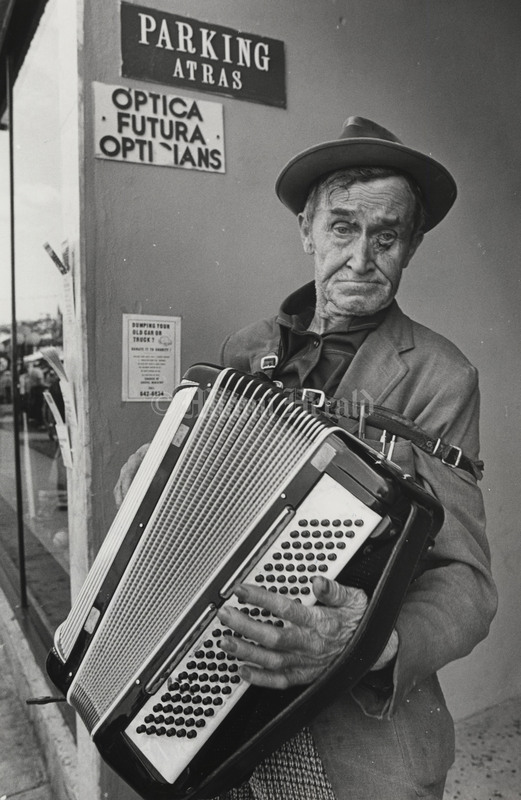 3/15/1982, Tim Chapman/Miami Herald Staff: A group of men playing their musical instruments on the street at Calle Ocho. 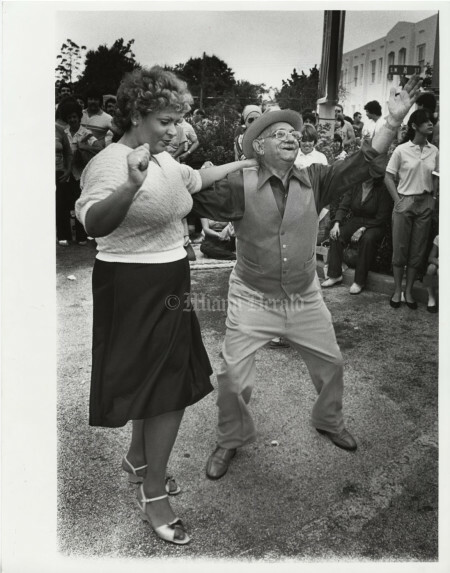 3/15/1982, Marice Cohn/Miami Herald Staff: Louie Charles Shabareck Jr. "plays" his broom at Calle Ocho. 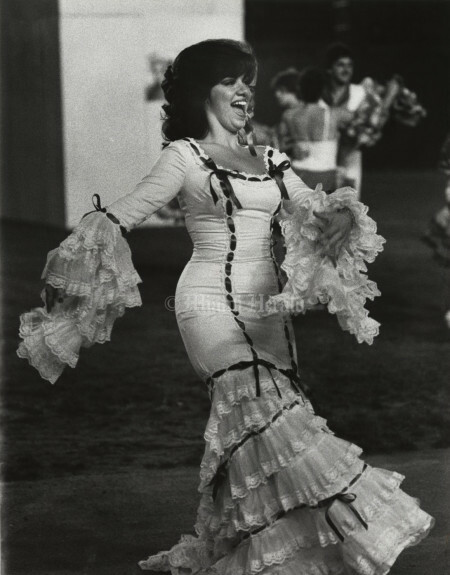 3/5/1988, Erica Berger/Miami Herald Staff: At the 1988 Super Fiesta held in the Orange Bowl as a warmup to Calle Ocho, Ritzy Gomez of Estampas de Colombia twirls to show her elaborate skirt. 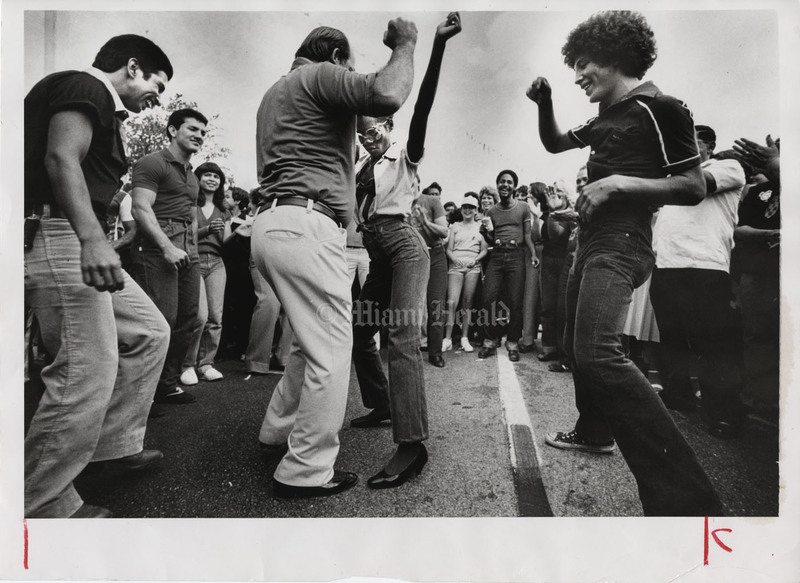 3/12/1979, Marlin Levinson/Miami Herald Staff: At Calle Ocho in 1979, Carlos Gonzalez and Amana Gonzalez feel the music as Henry Duenas and Eloisa Hjelm look on. 3/6/1983, Albert Coya/Miami Herald Staff: A classic Calle Ocho photo. 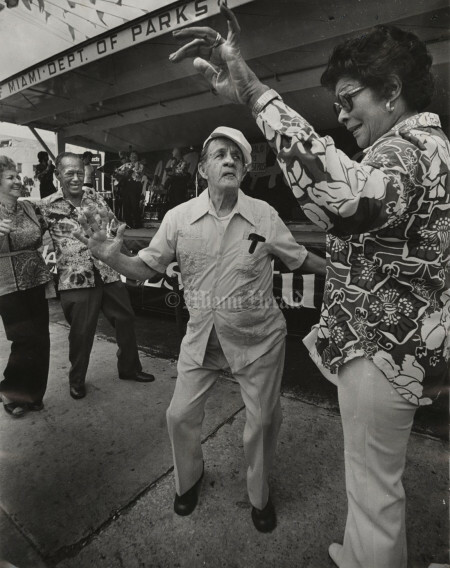 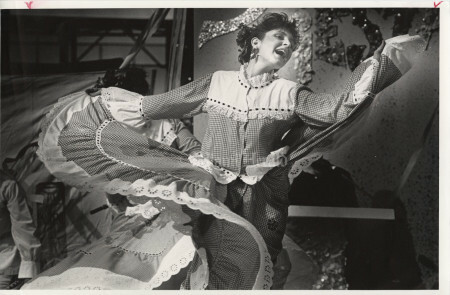 Felipe Soregui, 72, dances with Nora Sepulveda during the Miami street fair in 1983. 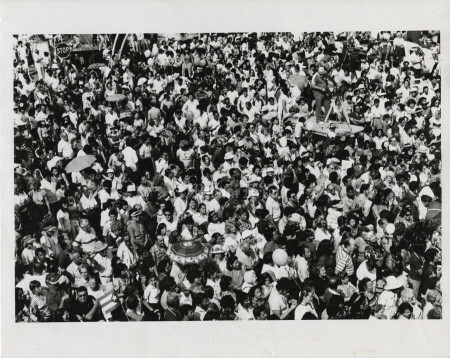 3/9/1981, Carol Guzy/Miami Herald Staff: An unidentified little girl with a Cuban flag as Calle Ocho gets underway in 1981. 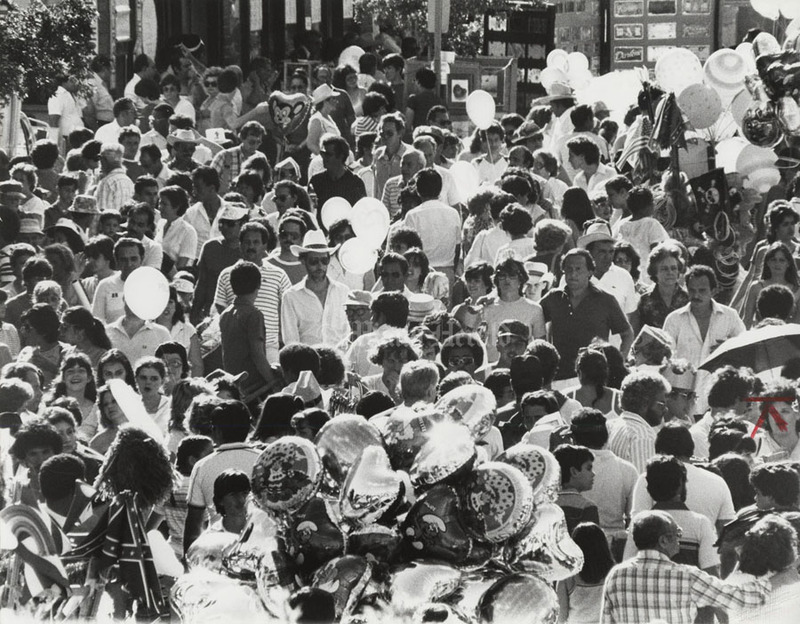 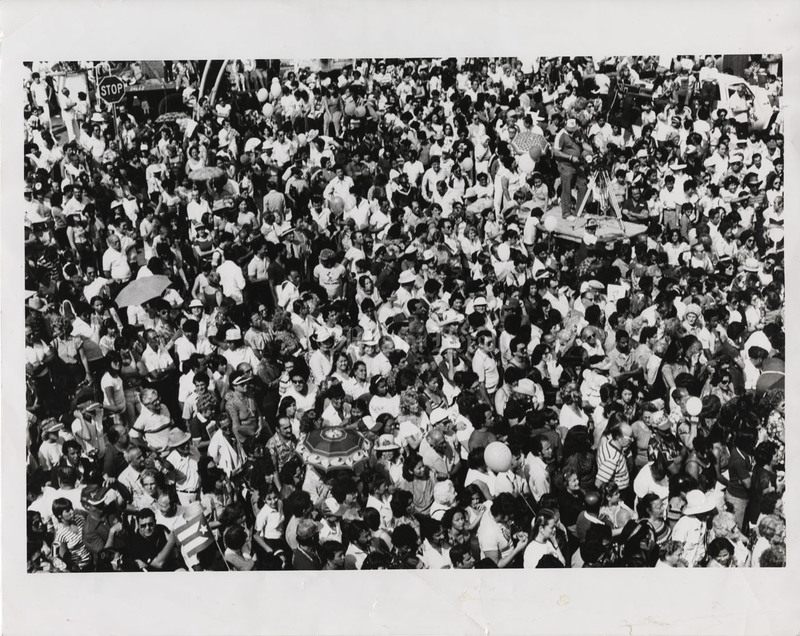 3/9/1981, Miami Herald Staff: People as far as the eye can see at Calle Ocho, 1981. 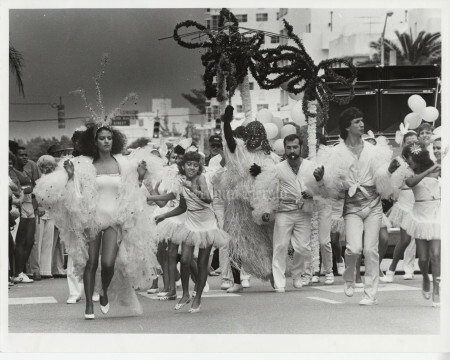 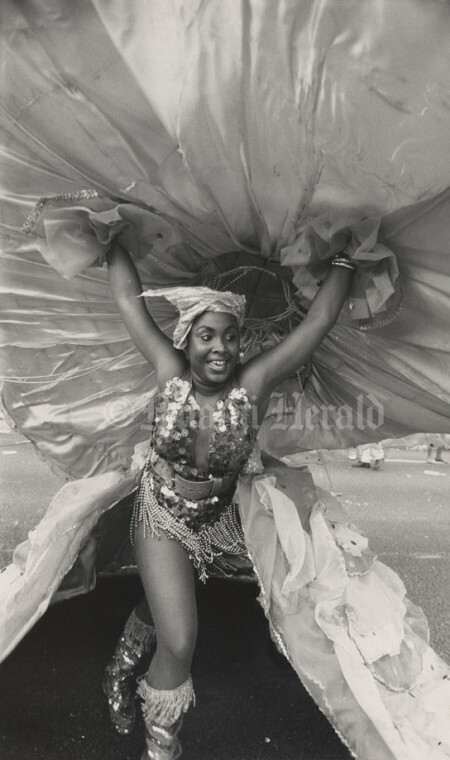 3/9/1981, Erica Berger/Miami Herald Staff: The Fantasia Cubana dancers conga southward along Washington Avenue on Miami Beach. The group had hoped to attract hundreds of people to dance their way down 11th Street, but the conga line ended up long on spectators and short on participants. 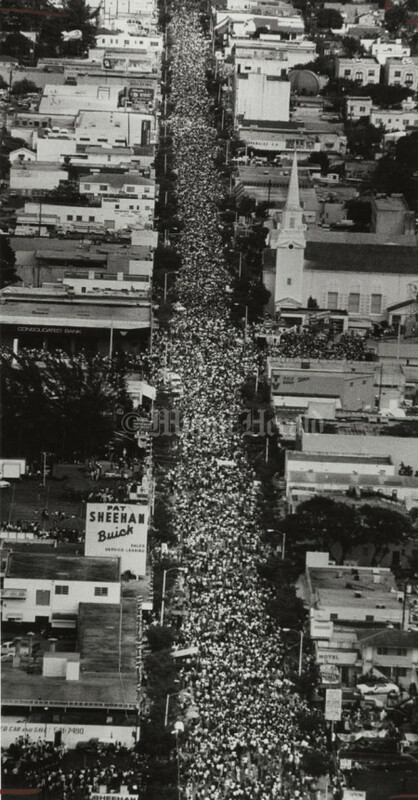 3/6/1988, Miami Herald Staff: Aerial view of festival crowd along SW Eighth Street (Calle Ocho). Pat Sheehan Buick and various hotel buildings are visible. 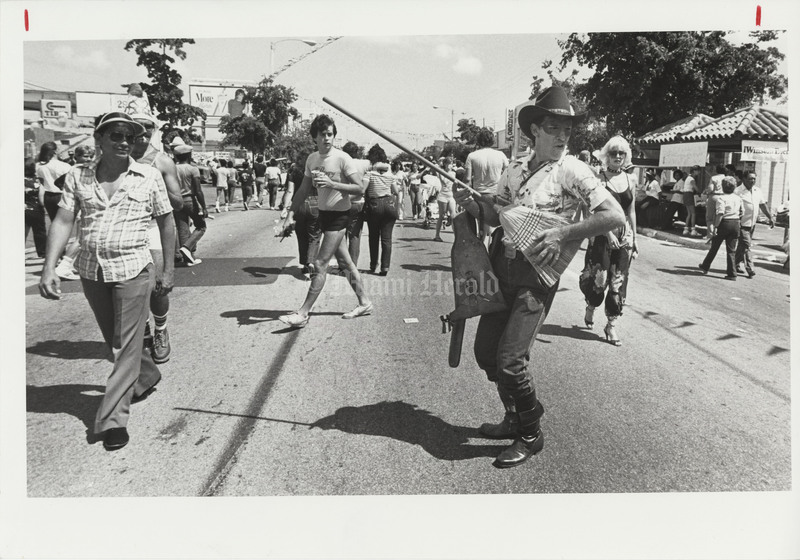 3/9/1981, Carol Guzy/Miami Herald Staff: Joseph Amsijus playing the accordion during Calle Ocho. 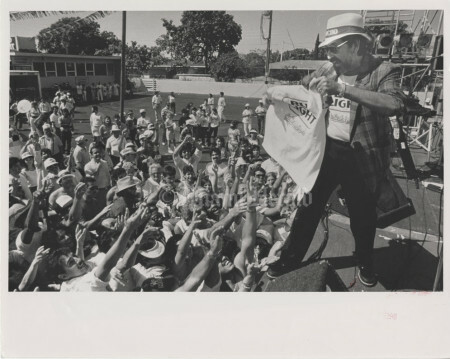 3/4/1983, Albert Cova, Miami Herald Staff: Arcadia Maria Alvarez, of Conjunto de Bailes Cubanos, one of many free events along SW Eighth Street for Calle Ocho Open House in 1983. 3/3/1991, C.M. 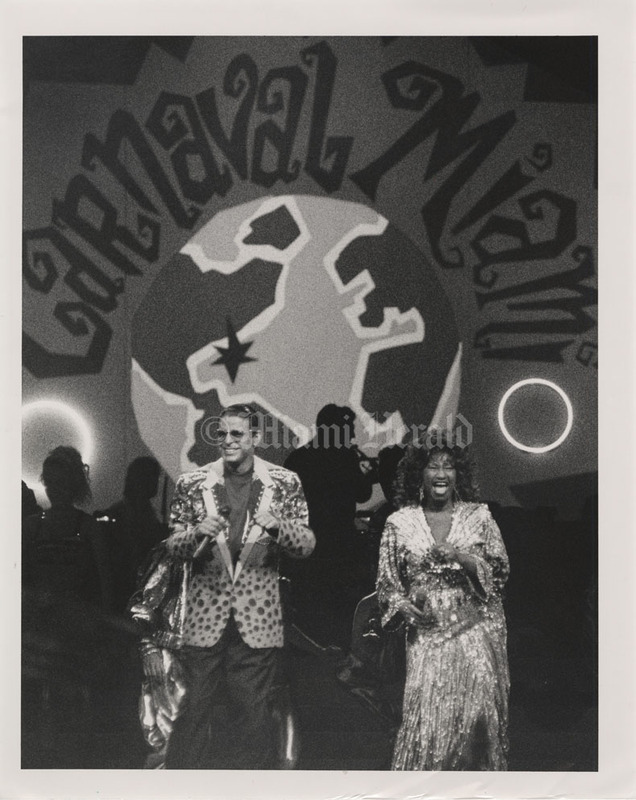 Guerrero/Miami Herald Staff: Salsa singers Luis Enrique and Celia Cruz - known as the Queen of Salsa - sing and dance at Carnival Miami in the Orange Bowl, a prelude to the Calle Ocho festival. 3/3/1991, Walter Michot/Miami Herald Staff: Calle Ocho, 1991. 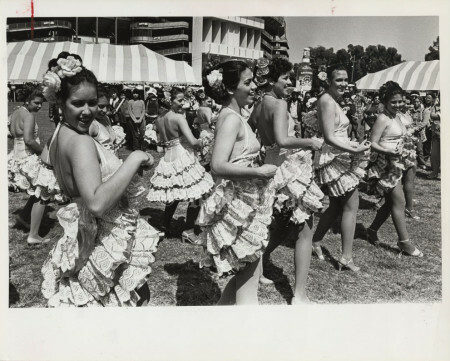 3/13/1983, Albert Cova/Miami Herald Staff: Girls of the Conjunto de Baile Cubano at Calle Ocho. 3/4/1988: Bill Frakes/Miami Herald Staff -- Looking east on Southwest Eighth Street from 27th Avenue during Calle Ocho. Published 3/5/1984: Albert Coya/Miami Herald Staff -- Carnaval Miami. Bernardo Puniel dances with a glass on his head.